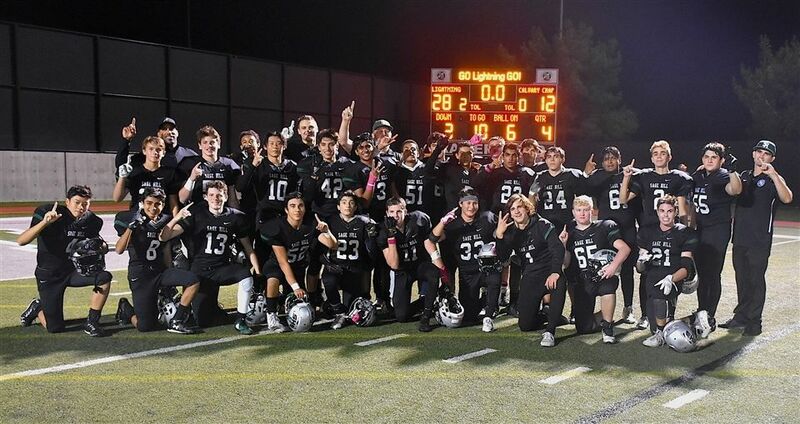 The boys’ varsity football team made Sage Hill history this season by having an undefeated season winning the school’s first league championship in the sport. This was the first year the team was in Express League, after the school’s move to the Western Athletic Conference this year. The season started with a game against North Valley Military Institute. It was a good game, but not a great game, Crabtree said. “That game showed both the players and the coaches what areas needed cleaning up,” he said. The team responded with eight consecutive games in which they improved week to week. “They really put on display their heart and character to each other and the blueprint of this football program,” Crabtree said. One of the biggest highlights of the season was the game played against Calvary Chapel Downey on Senior Night on October 27 at Ramer Field. The team now turns its attention on trying to get past the first round of the playoffs, as Sage Hill has been turned away the last two years in the first round, Crabtree said. After finishing 9-0, Lightning football was selected as the No. 5 seed in the 16-team playoffs, and will be hosting a formidable opponent in Flintridge Prep School on Friday, November 2.